Head over to the Catch the Bug Blog to see what the rest of the DT wants to show you. Darling darling darling...and such soft pretty colors. This card made me smile. too cute! Thanks for joining Mema's Crafts monthly challenge. I hope you will join us in other challenges and I wish you luck in this months draw. Ohhh Lori, this is WONDERFUL! I absolutely love that adorable image. Makes me think of Pixar movies...this is soooo cute! Lori, this is so cute! Love your Dp and image. Thanks for playing with us at TTCRD. OMGosh ... how cute is this card! Thanks so much for joining our "ANYTHING GOES" challenge at Shelly's Images! Please come back and join us again real soon!! 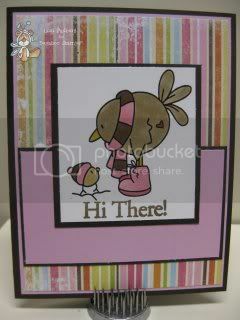 Aww, that image is too cute!Lovely card & fabby striped paper, too!Thanks for joining us at Sparkles this time & good luck!